Think a burglar is going to bother searching old VHS cassettes for valuables? Doubt it! Organize and hide your keys with this key hider modeled after a video cassette case. 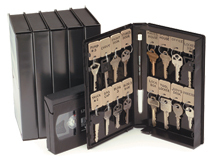 This compact key hider is lightweight, portable and easy to store in a cabinet, drawer or briefcase. Closed dimensions 8"h x 4-3/4"w x 1-1/8"d.